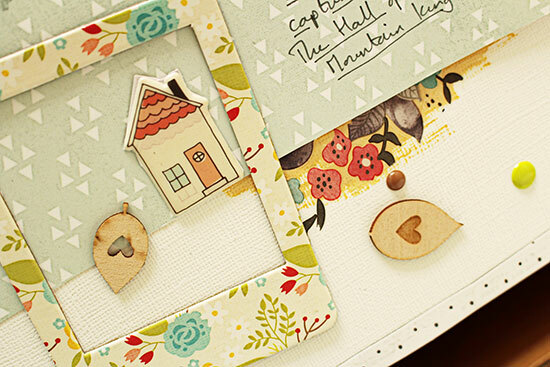 Here's a question (and there'll be one more at the end): have you ever scrapbooked photos for someone else? 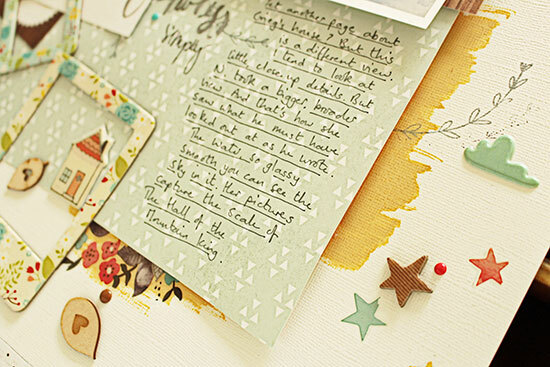 Or scrapbooked for yourself, but using someone else's pictures? Or offered your pictures to another scrapper? or any combination of the above? I know, I know: lots of you who are far better and busier photographers than I can claim to be are probably going to reply that you can't keep up with your own production as it is. And that would be more than fair enough. (as I discovered while making a page for Get It Scrapped): you can find yourself heading off in a new and unexpected direction. Get It Scrapped had asked for a page featuring photos which were not my own, so I turned, of course, to the girl with the golden phone. I'm always delighted to see that yellow case in her hand when we are out and about, because I know she'll spot a whole variety of details I'll be guaranteed to miss.She knows where to find a story. So I asked: if you were to choose, I said, any photos at all from your camera roll, to donate to me now, which would it be? And I had to smile. She didn't hesitate. Grieg's House, she said. 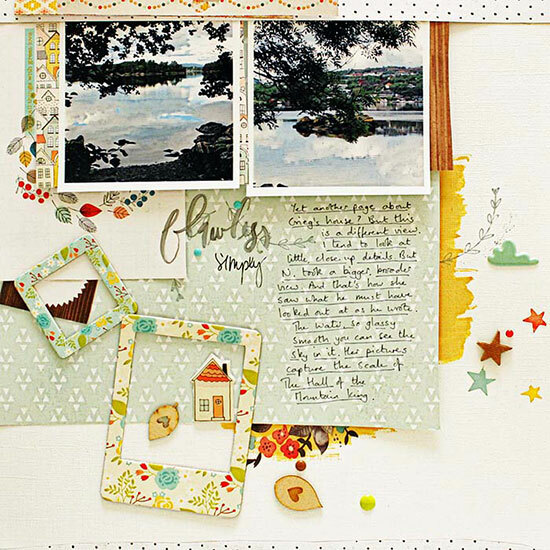 I've already scrapbooked several of my own Grieg's House pictures (here for the Gossamer Blue blog). It's obvious our visit made a big impression on all of us. So what could I do? I gathered up the new pictures and started to pull out papers. And a funny thing happened. On my own, if I had taken these moody, haunting shots, I might have chosen darker colours, made something of the silhouettes, tried for a classic feel. Instead, as I picked and started to cut, more and more I could feel the personality of the photographer creeping onto the page. It became brighter, softer, more fun to make. Rather than picking up what was in the photo, I heard her voice in the back of my head telling me to paint a picture of what else there was to see in that beautiful place. So that's what I did; and it has turned out to be one of my favourite pages this year so far. And that brings me to my other question. I loved making this page. I'd be very happy to make some more. Is there anyone out there who has a photo they'd be willing to offer? 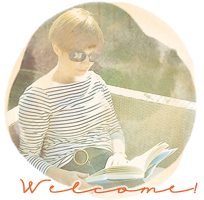 I've had an idea for a little series here on the blog: hardly a class, but definitely a freebie inspiration stirrer; and I've realised it would be even more fun if I could use one or two of your pictures along with my own. It'll be about design, and the thought process. Any takers? I'm thinking, if we agree, you could email me a photo and I'll post your page to you after I've used it for the lesson, with a little something as a thank you. Let me know if you are interested! I promise right from the start that full credit will be given, and that your picture will only be used for this one project and no other; and if you don't fancy the idea of me working with any of your people pictures, what about a place or a favourite thing? I'll leave space for your journaling. See? Other people's pictures: a whole new direction. This sounds like a great idea! I can't wait to see what you make! How fascinating, that you felt the photographer's personality emerging in your choices. A very interesting project. I've only scrapped a photo that wasn't mine once. As part of a challenge, at an all day crop, where we were all given the same picture. I love what you've done with these photos ... I also love TNSSO's new name, The Girl with the Golden Phone! As you've already 'borrowed' photos from me in the past (aerial shots of your city, if I remember correctly), it's only right and proper that I should offer to help you out with this new idea of yours ... count me in! I like your layout. I like how you have used those frames as not frames. Yes I have done a scrapbook for another person. A heritage album of old family photos for one of my sisters. Yes I have used a photo taken by someone else on a layout or two, "her" photo of the grapes on the vine was much better than mine. I would gladly volunteer a photo or two but I cannot image what would interest you. I'll go through the stash and get back to you :-) I think you will be snowed under with donated photos because everyone knows what an amazing job you will do with their photos. This is going to be (1) fun & (2) a most interesting project. I have definitely scrapped with other people's photos - I frequently use ones my girls post on FB as otherwise I don't have access to those parts of their lives. I've also scrapped total strangers photos in a Disney themed page swap. It really is an exercise in getting out of your comfort zone! I'd be happy to send you a photo (or two or five...) of mine. Just looking back over the last few minutes I have a bunch of contenders that haven't made it to a page yet! Oh! Sian you do come up with the most marvellous ideas! Of course I would love a page made by you. I'll send you something in the post. Whether you use it or not is entirely up to you. I imagine you will be inundated with photo's. Lovely page, Sian. And quite the intriguing idea. I cannot wait to see what photos you are sent and how you go about scrapping them. I think you may have more takers than you need (or want), but I'd love to send you a couple if you're still interested. It's a fabulous idea, and I love that the personality of the photographer overtook the photo itself when you scrapped it! I occasionally use photos I didn't take; usually ones my adult children have taken and have sent to me. Yup. I'm loving those frames and the 'wreaths' of leaves etc, on the bg..... interesting how your page took a different turn to what you expected! LOVELY page.... yup! Done a lotta pages from others & some FOR others.... & once, 3 of my mates & I used photos of the 4 of us...same photos....& scrapped them our own way. That was fascinating & we were all tickled pink with how our pages turned out:) If you want a photo from me, feel free to ask. Hubby took one of me today that I actually like. Doesn't happen very much. My legs look long. I'll 'take' that!!!! It is so coincidental that you would post this. I just announced at our AYM (A Year of Memories) meeting on Monday that we would do a "round robin" in 2016 for anyone that wanted to participate. We are doing exactly what you suggest: surrendering photos for another to scrapbook. I think it sounds like such a fun idea to learn from other's inspiration. I can't wait to see what you do here. I'm sure you will have many takers on your offer. But should you need more---you can count me in. I love the whole *everything* of this post! Yes, I've scrapped with other people's photos: my own live-in photographer, my friends when I document our twice yearly cottage trips, and I even scrapped a page or two with photos of Helen's once, way back when! What a lovely idea Sian! I loved reading about your page and how your inspiration came from a different place with the different photos! I scrapped someone else's photos once at our crop, when we gave each other kits and photos. I like how the page also brings out the photographer's personality as you scrap - great job!! I have scrapped others photos for the couple of scrapbook-for-hire projects I did this year. Both turned out quite different & I enjoyed the change from my own photos. Oh Sian, what a wonderful idea. I've scrapped with other people's photos a few times and it does feel strangely freeing because I could scrap the photo not just knowing about the picture but knowing the person behind it. I would LOVE it if you could scrap one for me. The boy and I have had some photos taken for our save the dates and I would love one of these made up to put in our new house! What a wonderful and interesting idea Sian. As others have already said, the 'girl with the golden phone' sounds so intriguing and like the title for a book or film. Interesting idea! If you're still wanting pictures I have 1 or 2 I could send you. I love your take on the pictures "the girl with the golden phone' gave you and especially love that green you've used on the page. Is this "the girl with the golden phone" replacing "the not so short one"? I meant to say that when I did the album for my niece when she was getting married I used a lot of photos that her Dad took. It was kind of neat comparing the pictures he took with the ones we'd taken of the same occasions. At a crop a few years ago, one of the challenges was to create a layout for someone else with their photos. We also did a challenge, where you started your layout, then passed it around, so everyone did something on someone else's. A great page and a great post. I have scrapped someone else's photos but only when they've taken a photo of me. I have printed some photos a friend took of my niece which a intend to scrap soon. I would love you to scrap one of my photos!